The Cocos-Keeling Islands are a tropical paradise located in the Indian Ocean some 900km from the Christmas Islands and over 2500km from Perth. The nearest major land mass to these idyllic coral atolls is the island of Sumatra in Indonesia. It is perhaps fitting that this gorgeous, yet remote, area of the world have given their name to such a pretty species of dwarf angelfish. Well, to be honest this is not the only common name by which Centropyge colini is known but how can such an attractive and rarely encountered species be justifiably called something as understated as Colin’s angelfish? To be fair the latter common name is given in honour of one of the people that discovered it, Patrick Colin, as recently as 1974. Perhaps the most apt common name that you are likely to encounter for this species is the blue-back dwarf angel. Although C.colini is found around the coral reefs of the Cocos islands its natural range is a little more extensive than its common name suggests being found around the Christmas Islands in the Eastern part of its range (almost certainly the source of the specimen illustrated here), ranging to parts of Indonesia, Guam and the Marshall islands. Ironically the Cocos Keeling islands do have an endemic species of angelfish, Centropyge joculator that resembles the bicolor angelfish (C.bicolor). It should not be underestimated just how little is known about this species of angelfish in its natural environment. Not only is it found in a remote part of the world it is also very secretive inhabiting rocky crevices and overhangs of the outer reef in depths of up to 100m. It is known that in common with other dwarf angelfish that C.colini can be found in small harem based groups of between 3-7 individuals. Nothing is known about the natural diet of this species but we can guess by looking at the foodstuffs consumed by its close relatives. It is likely to include algae, sponges, tunicates and a variety of benthic organisms as such items form the basis of the diets of most other dwarf angels. The good news is that this species does seem to accept most of the usual foods such as brine shrimp, mysis and dried algae and the latter should always be available to this species as individuals enjoy browsing for much of the day. Should you be lucky enough to encounter C.colini at your local dealers it is imperative that you ensure that it is feeding before you are tempted to purchase it. Don’t be put off by the colours appearing a little wishy-washy as newly imported specimens held in fish only selling systems always look like this. Once introduced into an aquarium with plenty of live rock their colours become much more vibrant as they settle into their natural mode of existence staying close to the rocky substrate in the less well-lit areas. There are some reports on the web of this species not doing as well as other members of the genus and Marine World certainly cannot dispute this. However, many of the problems appear to rest with the condition of specimens when they arrive at the importers rather than subsequent introduction of well-acclimated into suitable aquaria. Although a very desirable species if you are considering sourcing a specimen you should exercise self-control and not necessarily buy the first specimen you come across. Considering the rarity of this species and the lack of knowledge within the scientific community about it then we might expect C.colini to command a high price in the trade. It is difficult for us to be certain of the retail price in the U.K. as the photographed specimen here is one of the few we have encountered. It was imported by one of the U.K.’s largest wholesalers and the asking price in the shop was around £90. This really is not bad when you consider that the Coco’s - Keeling angelfish is rarer than the multicolour (C.multicolour) that retails often for significantly more money. 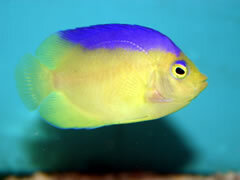 In fact it is not much more expensive than the flame angelfish (C.loricola) and should be just as rewarding to keep.